Year 10 student Shaun Yap has been awarded a medal in the UNSW Global International Competitions and Assessments for Schools (ICAS) competition. ICAS assessments are designed to recognise and reward academic excellence in students who demonstrate a deeper and thorough level of learning. Shaun correctly answered all but the last question on the competition paper, thereby achieving the highest score in Year 10 Mathematics in Western Australia. Principal Mr Michael Morgan attended the ICAS medal presentation ceremony held at Perth Town Hall where Shaun received his medal along with other proud recipients from WA schools. Shaun had recently received a Distinction in the Australian Intermediate Mathematics Olympiad (AIMO). Japanese sister school partner Kashiwa Municipal SHS’s Brass Band has performed for our students on the Japan Tour 2018. Shenton College and Kashiwa MSHS are celebrating 18 years of successful ongoing exchange this year. 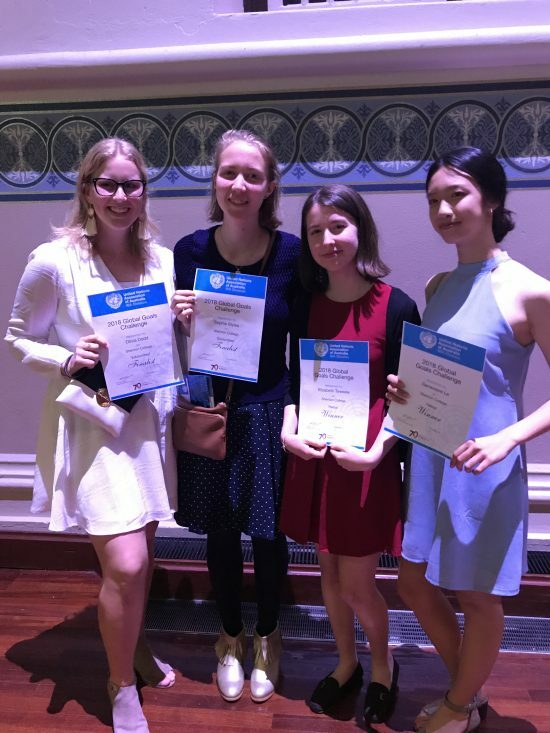 What a night for Shenton STEM at the United Nations Association of Australia (WA region) World Teachers’ Day award ceremony, held on Friday, October 26. Shenton College had six finalists in the running for awards and four came away with prizes! Academic Programs Coordinator, STEAM and Mathematics teacher, Samantha White, and Academic Programs Coordinator, STEAM and Science teacher, Rebecca McKinney, were both recognised for their commitment to teaching STEM and for piloting the Global Citizenship & Sustainability Program at Shenton. 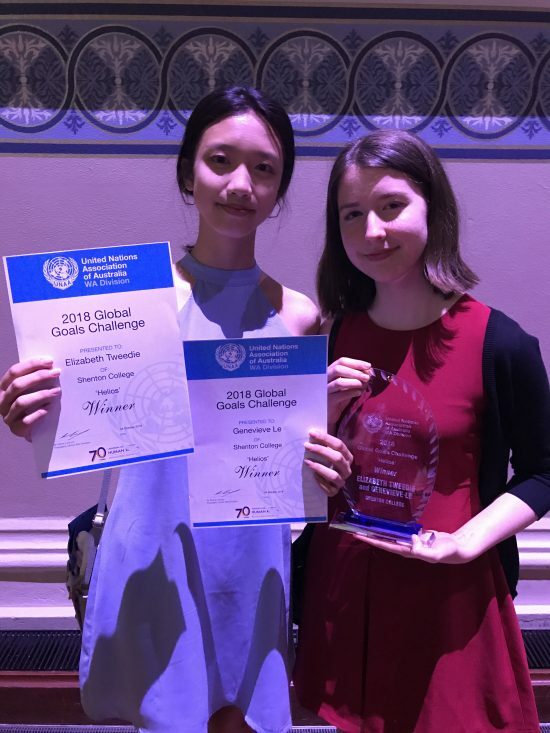 Four of their STEMINIST students were finalists on the night, and Year 10 students Lizzie Tweedie and Genevieve Le, won the secondary school category 2018 Global Goals Challenge for their Helios app. Only recently Genevieve and Lizzie won the WA Innovation Day award for the Helios app and subsequently met with Paul Litwin from Innovation Institute and two representatives from Kleenheat who will be working with them to secure intellectual property and get the app off the ground and piloted at Shenton College in 2019. Helios is an app the girls have created with empathy for the student and their needs, focusing on mental, physical and emotional health. It is the perfect solution to fill the gap of the traditional paper school diary. Shenton Year 10 students Olivia Dodd and Sophie Styles were also finalists at the UNAAWA awards evening for their Edutunities project. Both projects came out of the Year 10 STEM course that Rebecca McKinney and Samantha White have championed at Shenton College and the awards are wonderful recognition for their hard work and dedication. The night was also an opportunity to gift STEMINIST badges to the Honourable Kim Beazley AC (who is Hollywood Senior High School alumni) and Honourable Dave Kelly MLA. Shenton College in partnership with UWA Judo has established the Shenton College Judo Academy. This partnership adds to our already successful Shenton Rowing program and Shenton Sailing program. The Shenton College Judo Academy will be held in the Shenton College gymnasium under the tuition and instruction of UWA Judo’s world class instructors. Commencing in Term 3 on Wednesday 18th July, students can participate in a free trial with no obligation to join. The Academy will then run a 10 week course from 25th July concluding on October 10th with a grading and belt presentation ceremony. Cost is $150 for the full 10 weeks or $20 per session. Judo is both an Olympic sport and highly effective martial art. Students will be taught all aspects of the fighting/defending techniques as well as develop their physical and mental strength. Please see the attached flyer or if you have any additional questions please contact UWA Judo Club coordinator Peter Swan on 0418 904 009. The CO2 Dragster competition is run every year and incorporates innovation and design with enriched activities that encompass STEM philosophies and procedures. We are happy to announce that Nick Daw has won this year’s hotly contested State Final. Shenton Design and Technology department has won this prestigious trophy four times over the fifteen years it has been running , which is definitely something to be proud of. You are currently browsing the archives for the Goings On category.